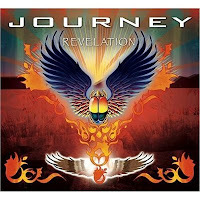 Classic rock struck back this week on Talking 80s Music as we featured new music by Asia ("Never Again"), REO Speedwagon ("Find Your Own Way Home") and Journey ("Never Walk Away") from their latest albums. There is nothing quite as thrilling as being able to share something new with you and let you know that these talented musicians haven't faded away. So many other songs could have been chosen but we went for the singles. Last minute we threw in an Aerosmith request ("Helter Skelter") from Koolguy who also gave us an update on his ZZ Top concert. (Although the group's version of the Beatles classic was recorded in 1975 for the Toys In The Attic album, it didn't get released until 1991 on Pandora's Box. Yes, we are that much of sticklers to our 80's and forward agenda around here.) Totally80sOnline.com's Aaron Phillips also talked with us about the resurgence of these amazing artists, the record business, his station, upcoming events and his station manager (his dog) Dakota.